This seems rather anti-climactic since you've seen the flimsy and a lot of the components on both the 'paperless' paper-piecing post (how's THAT for alliteration, unintended to boot?!) and the Cutting post, and then as featured on Paintbrush Studio Fabric's blog, and beyond, eeek, like Aurifil and Pinterest omg...but all that aside, presenting Freefall! 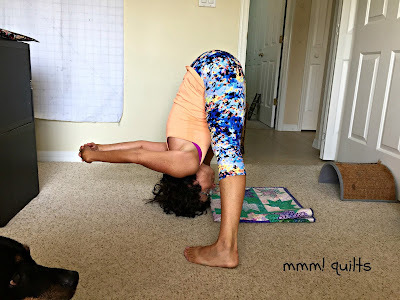 This was one of my Q1 FAL goals, and I'm so happy that I can check it off as done! My list is here. This is the wallhanging size of the big quilt I made, Windfall, which was done with Paintbrush Studio Fabrics as well, in the Windfall line. I don't think I could pick my favourite as I adore both of these lines so much. We are doing the wallhanging as a quilt along, and it is not too late to join in if you haven't heard about it or have been sitting on the fence! Steps are coming out bi-weekly, quite do-able IMHO. 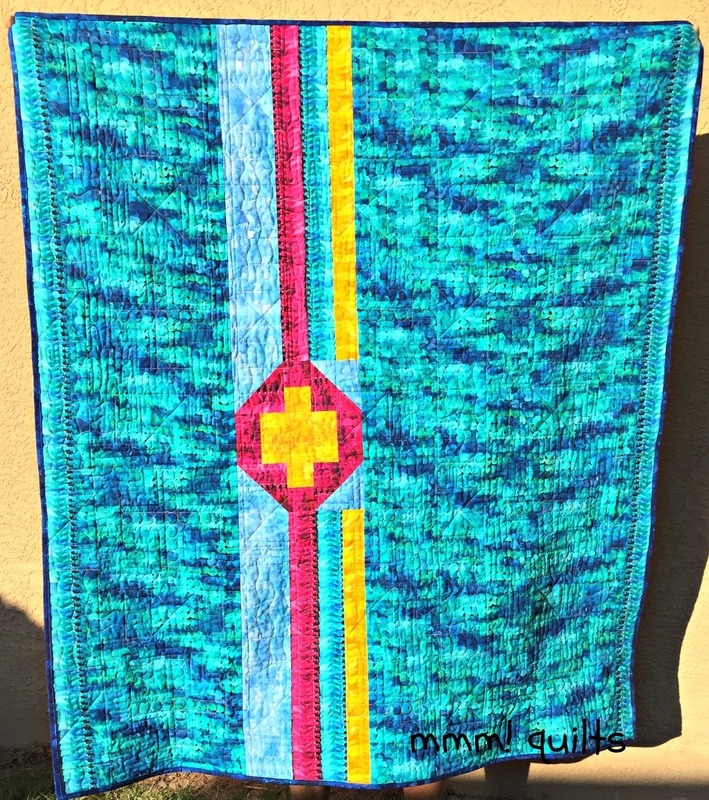 Click the Freefall Quilt Along tab at the top and you will see what's what so far. The flimsy went together very quickly. Layering was next. I spray-glue baste...I first heard about it in a Stack 'n Whack class I was teaching back, uh, let's leave it at some time ago, from a student in that class. 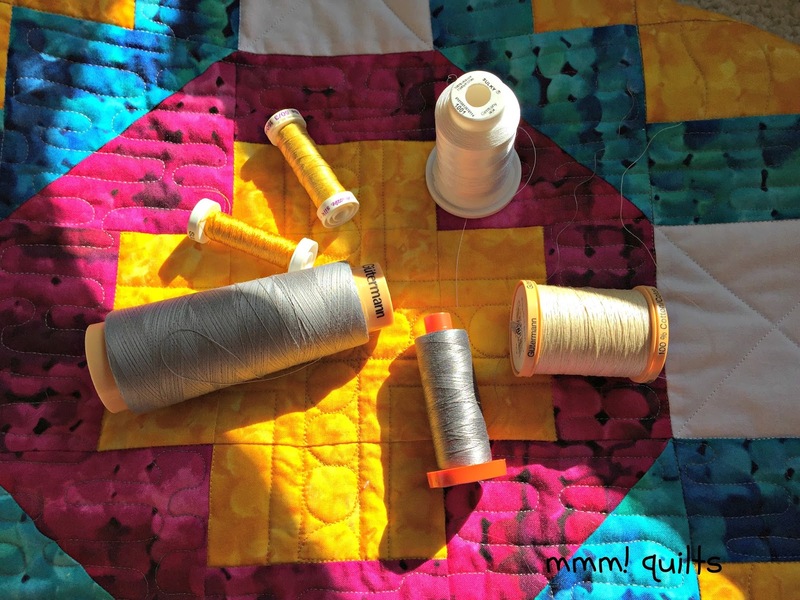 The way she described, 'throw my quilt in a corner'...'leave it sit for a while'...'washes out not problem'...'no pinning'...'changed my life'...well it certainly changed mine! So I spray-glue basted this puppy. No. Wait. First I had to decide on a backing. I nearly went to the LQS to buy something but then I thought why not use some of the leftover fabric since A. I have some and B. I love it so much that having it on both sides is a bonus and C. I love patchwork, ergo interesting backs! So I cobbled together several of the prints, layered and started ditching. I always always stitch in the ditch. 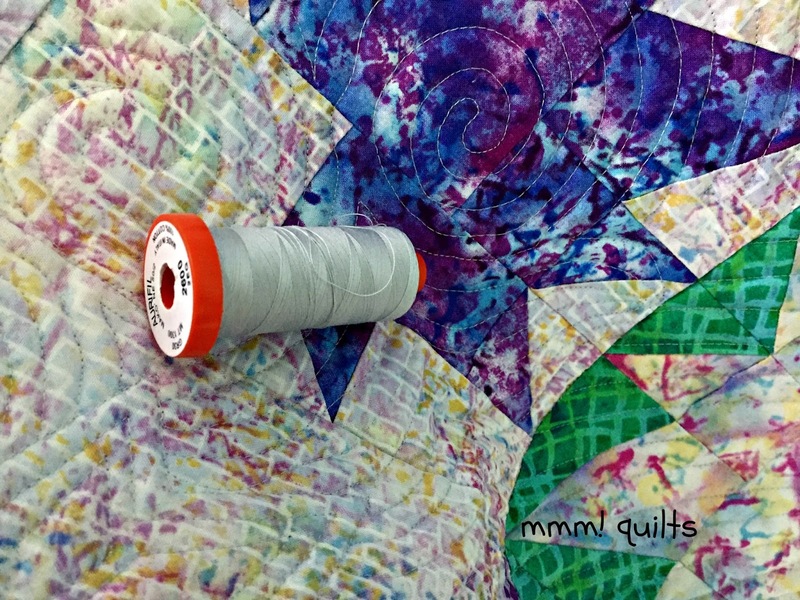 It stabilizes the quilt, and even if you are FMQ-ing the death out of the quilt, the lines will disappear. I think sometimes that puckering happens when people jump in and start FMQ-ing without having ditched. Just my opinion, but I've never had a pucker or fold on the back in over 20 years now of quilting. 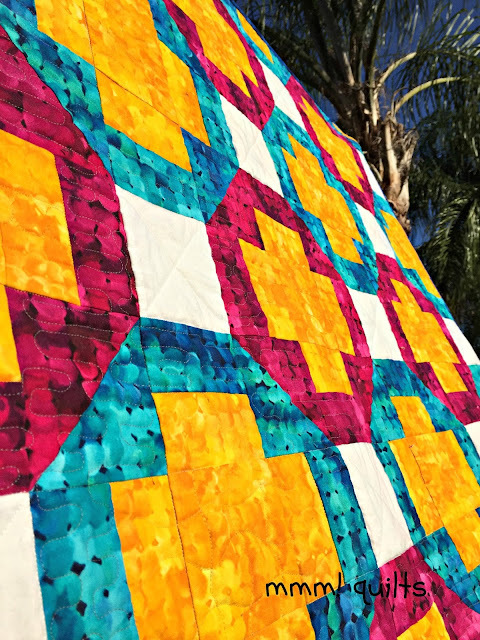 This quilt has 25 blocks, so I stitched the grid they make. 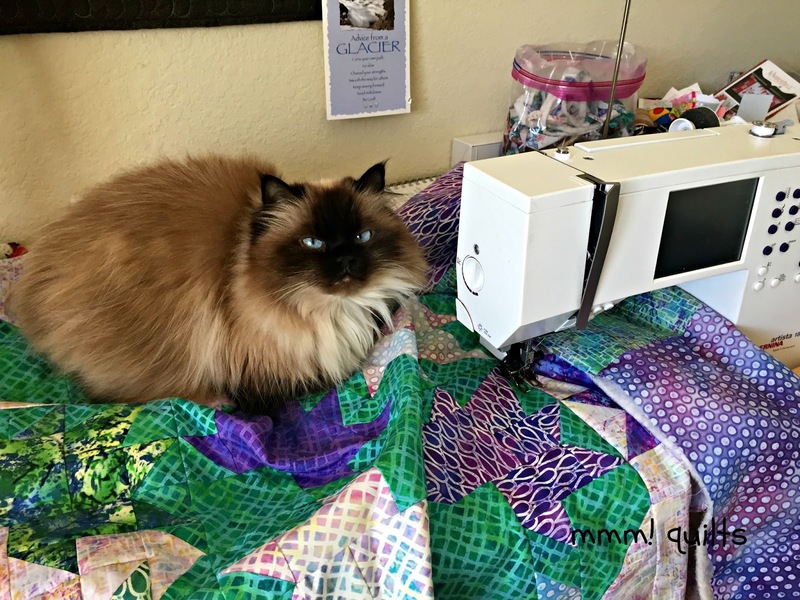 She loves new fabric, new quilts, and takes her hold-down-a-quilt job very seriously. I decided to do straight-line quilting in the shadow leaf. Not having a ruler foot for my Bernina, I used my walking foot. The next dilemma was to decide on a thread. There are many colours that float over the green so I didn't want to use green and have it blend/pop/blend/pop kind of thing. 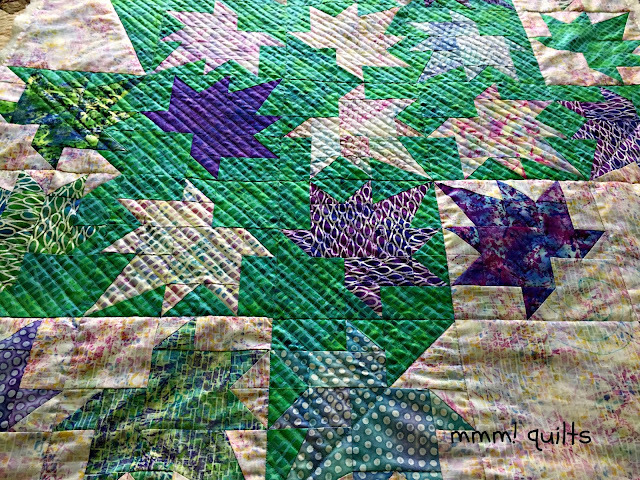 Because there are layers of leaves in this quilt, I ignored those that float on the big shadow leaf. I remembered Angela Walters saying that she turns to a pale grey or pale yellow when going over many colours. I had Aurifil 2600 with me and laid out several coils across the leaves. Yep, I think it would do it! I thought it worked so well that I used it for the background, where I went with a contrasting motif, swirls, hoping to evoke the swirling winds of Spring. I always quilt in a surprise or two. Had to put a ghost leaf in this one too! Windfall has three I believe. I tried to keep the lines of the swirls about the same distance as the straight ones, but they ended up being a bit closer I think. As I often do, I made the label an integral part of the backing. And of course I now also (usually remember to!!) attach my label from Ikaprint. 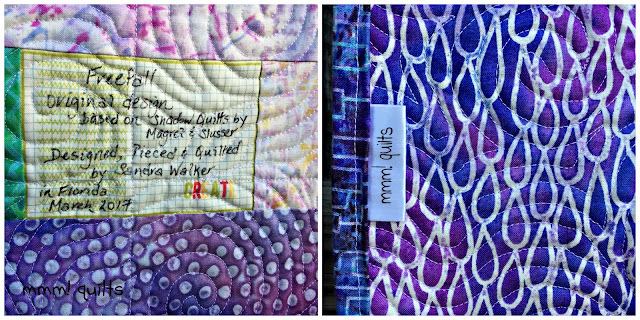 You can see I used the purple 'brick' print as the binding; its twin, the pale low volume one is the background on the front of the quilt. Aren't there some oh-so-cool prints in this line? The dots! Those raindrops!! I'm SO glad I did decide to build the back with the leftover prints. Paintbrush was very generous with the yardage they sent me. Here's the front again, as pegged to the fence with the evening sun just touching parts of it. 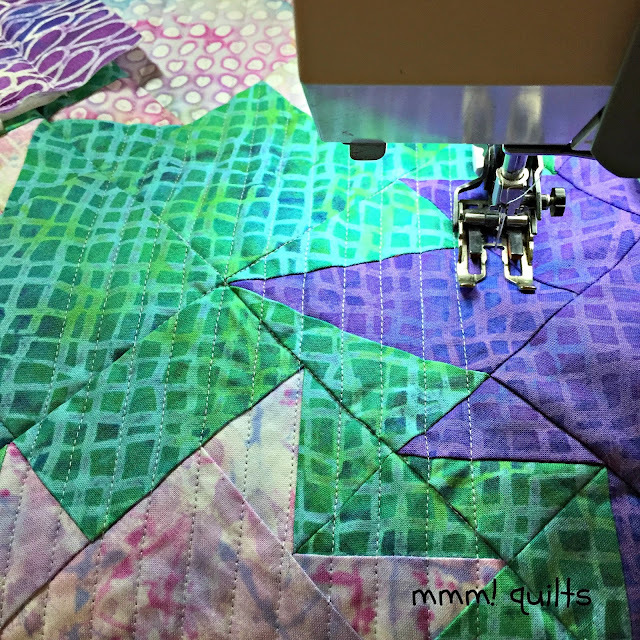 I have lots of ideas for shadow quilts, and actually drafted another for the design challenge that finished earlier this month. I'm working on a floral one at the moment. Remember Step 2 instructions come out on Monday, April 3. Those will be the first sewing ones. I do have a pretty good excuse. Really. I was on the road (still am). Perhaps gabbing my head off with the likes of Tish and/or Julie when I should've been writing. Forgive me? Top is leaf, next is background, purple is binding, and then the others below are the floating leaves. You'd have two more baggies: one for leaves that float on the big shadow leaf, and another for those that float on both background and shadow leaf. Update! I have the leaf point template in PDF format for you to download if you'd rather not draft it as per the tutorial. Click here to get it. (affiliate link) Thank you Tish! One day I hope to be as good as she is on EQ7. I promise that Step #2 where we start to sew will be out on Monday, April 3. I got the red row of my migrating geese quilt done, once again, mostly as a leader/ender project. 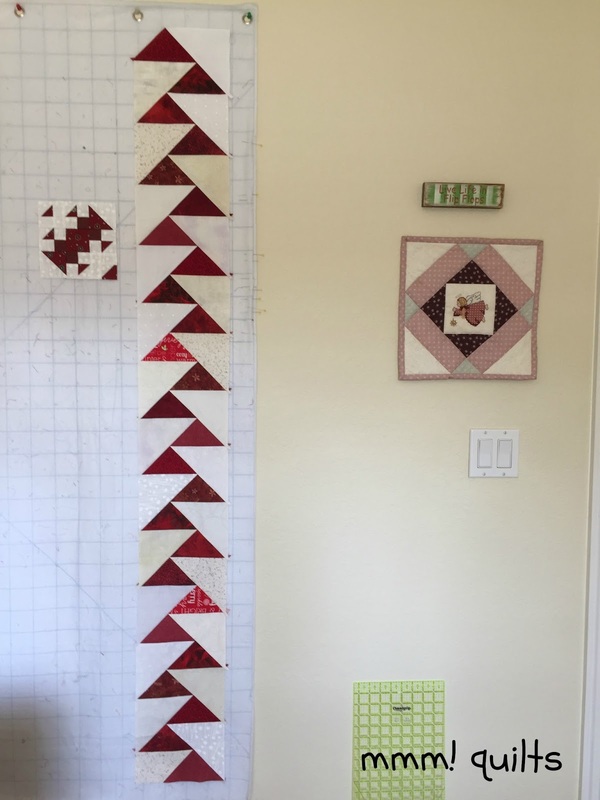 Rather fitting that I madly finished the row on departure day minus 1, spending a last quiet hour in the morning busily sewing the last few triangles and unpacking the red and cream scrap baggies to make one of the three 150 Canadian Women blocks for that week. Rather fitting as well is that it was for the woman who was instrumental in introducing Home Economics, aka Domestic Science, courses for girls in public schools. Bella helped out, as per usual. This corkscrew pose was due to it being a little hot, and a need to work out a couple of kinks in her spine. 52 Elizabeth Arden - had to drop out of school, but went on from taking a job as cashier in a beauty salon to taking over the business, and then to being one of the first women to run an international business; I particularly love the fact that she could still stand on her head in her 80s! 53 Esther Pariseau aka Mother Joseph - she learned carpentry from her father, and was probably the first female Canadian architect, born in Québec, but travelled 6000 miles through the Panama Canal to settle in British Columbia where she designed and oversaw many buildings; 54 Hilda Ranscombe - captain of the Preston Rivulettes, Canada's most famous women's hockey team, and was the fastest female skater in the country. Do you see the 3 black circles in one of the triangles of Hilda's block? I saw that scrap and knew immediately it would be for her to represent hockey pucks! Yup, we got together again! 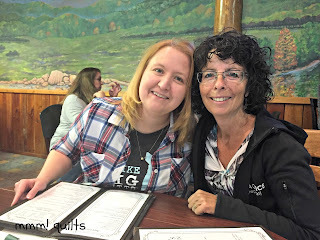 We had a great dinner together, visit, and I got to hear Tish's longarm story again, which will give you chills, this time as told by her cousin Doug, who is basically her big brother. We even had breakfast together the following morning, and afterwards got to meet her fur kids, darling pibble boys, small rescue dog Maggie and three cats, before heading up the road a mere 3 hours or so to our next rendez-vous, getting together once again with Julie and her husband, and meeting the last two of her five kids (we've already met the first 3) and their wonderful dogs, two of whom are pibbles. How we love dog peeps! I was on the floor at Tish's house with her three canine kids, and then at Julie's son's house with five dogs milling around, getting kisses, giving pats, and in LOVE. I know I will treasure these get-togethers for the rest of my life. We are currently visiting our daughter, Dayna, for a few days before we cross the river back into Ontario, Canada, and head to our new little house. I think I may have succeeded in bringing the sun north; it was in and out the first day, and then in the later afternoon it came fully out the next day, and this morning a clear blue sky! How I love to see and hear all the various birds chirping merrily away, so busy! Canada geese are establishing nesting rights on the pond; I associate their honks and calls and splashing and waddling with early Spring..."Fly Away Home" anyone? Love that movie. 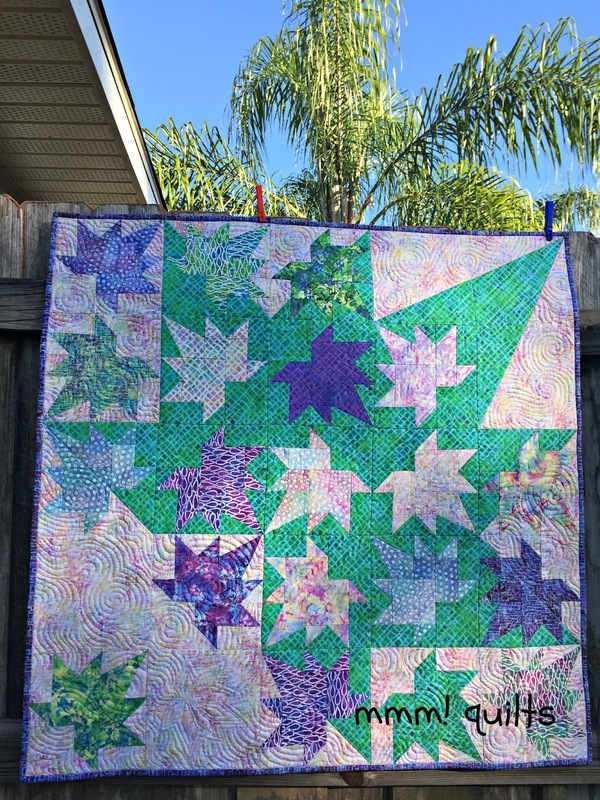 I was able to take advantage of a great St. Patrick's Day sale at Alma Sue's Quilt Shop in Sarasota. All fabric was 20% off, even the $5/yard rack! All of these were $4/yard except for the stripe!! The first three on the left are destined to be backings, (the plaid, destined for Brady, is a beautiful flannel! 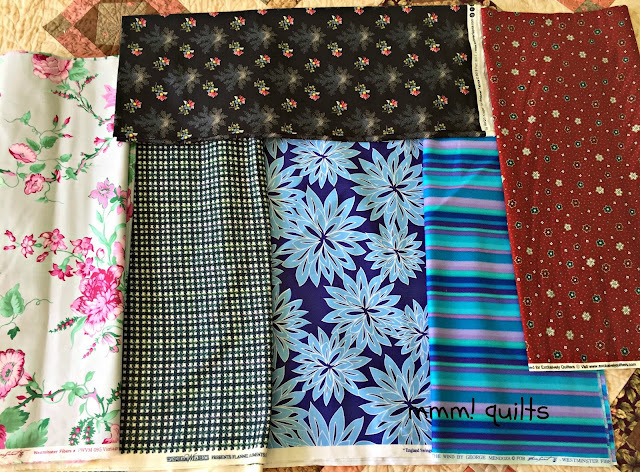 ), the stripe is for binding, and was $6.80/yard, and the red floral will go into some 150 CA Women blocks, and the navy floral I was drawn to and bought a yard, just because. 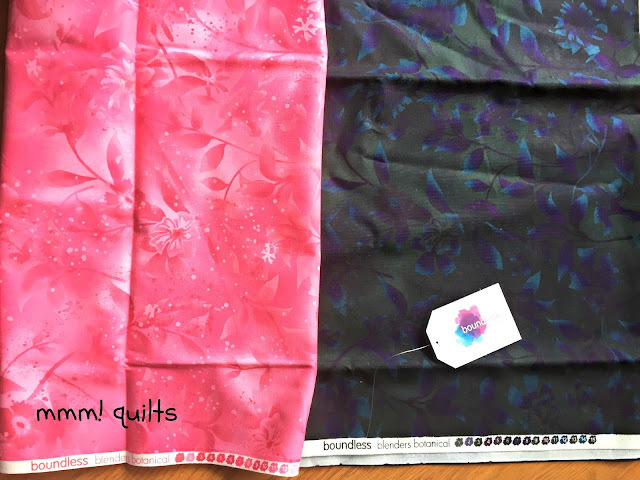 These are just two of Craftsy's Boundless Blenders line (affiliate link) that were waiting for me here at Dayna's. I also bought a fat quarter stack of blues for a midnight blue-themed quilt. OMG they are incredibly rich! At $9.40/yard all day long, they are an incredible price to boot. The pink is a stash addition, and the olive/purple/aquamarine one will be a border for the midnight blue quilt. Midnight!! 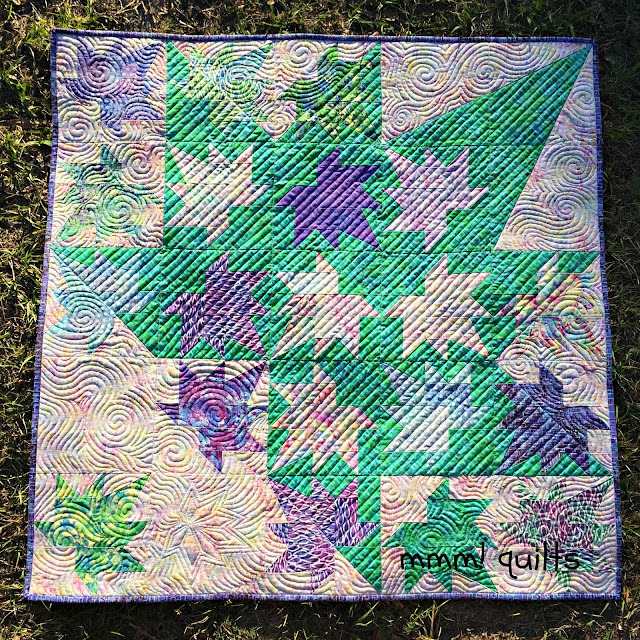 Tonight Angela Walters' Midnight Quilt Show is back! Cannot WAIT!! One goal was to watch more TV. I know it seems weird but I am just not a TV-watching person, yet there are a lot of very good shows out there. I finished season 1 of 'Gilmore Girls', I have one episode left in season 1 of 'Happy Valley' and I've started the new season of 'Grace and Frankie'. I watched a few more episodes of 'Call the Midwife' so I am now in season 4. I've also watched the first three episodes of season 2 of 'La Femme Nikita' and a couple of season 1 of 'Murdoch Mysteries'. I even watched the movie, 'The Breakfast Club'! Unfortunately, the Craftsy classes I need to finish... still need to be finished. As for books, I've read nine so far this year. 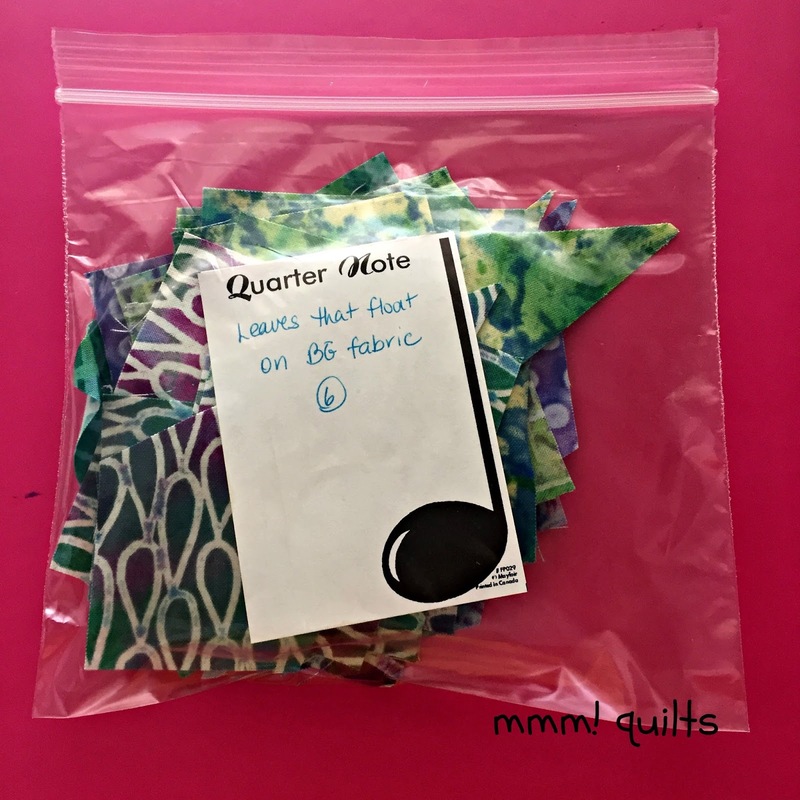 A few of the most recent ones were thanks to other quilters' recommendations. The first recommendation was Laughing All the Way to the Mosque, written by the same woman who created "Little Mosque on the Prairie" a show MacGyver and I quite enjoyed, that also taught us no small amount about Muslims and the Islamic faith. This book is both hilarious and informative. Zarqa was born in Liverpool, England, but moved to Canada at a young age. From there I hopped down to Botswana. I always read at least one Ladies' No 1 Detective Agency book when I'm in Florida. 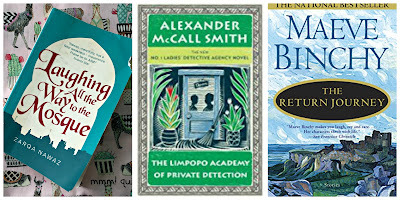 This year I read The Limpopo Academy of Private Detection. Gentle wisdom combined with humour is Alexander's trademark. He was born in Zimbabwe to Scottish parents. The Return Journey is actually the book I just finished, a collection of short stories. 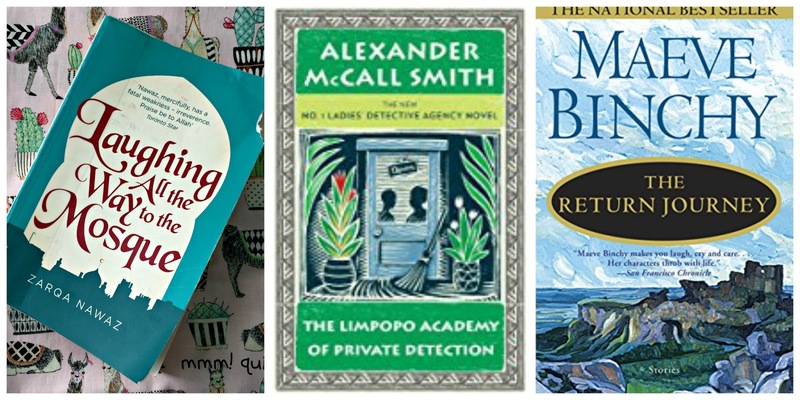 I've read several of Maeve Binchy's books, always a good read from this Irish author. 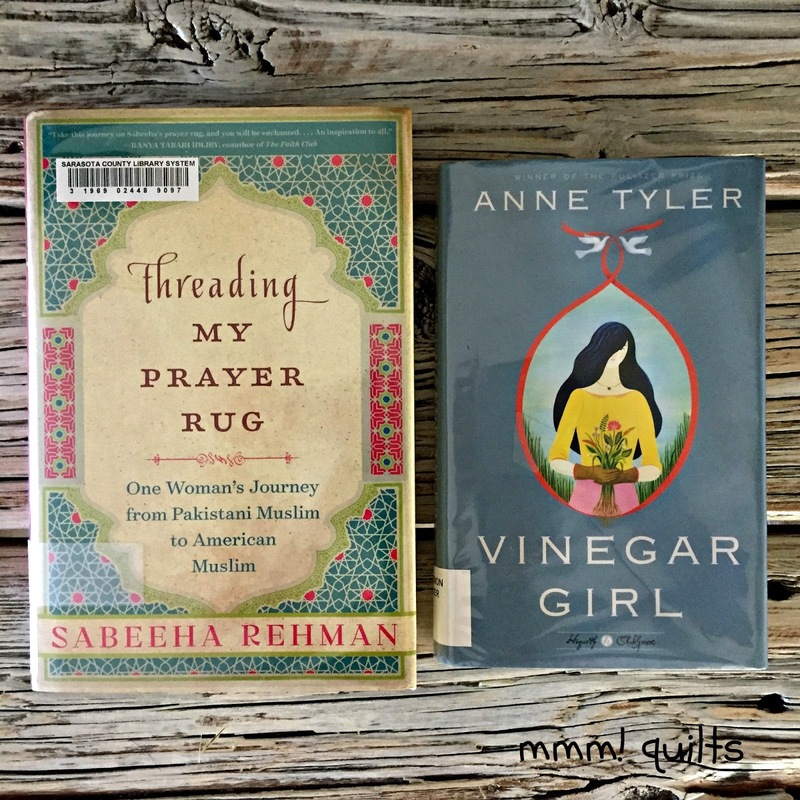 The same quilter who had recommended the Nawaz book also recommended Threading My Prayer Rug. A Pakistani-born, American immigrant of the 70s was the next Muslim author I read. Interesting to note is how to pronounce Muslim: think pussycat, push, put, and that 'u' sound is how you say it, followed by an 's' sound, not a 'z', not rhyming with 'buzz'. Interesting also, yet sadly, that along with all the media's misinformation, the majority of them do not pronounce it correctly. This was a very eye-opening view of America from a tolerant practising Muslim. 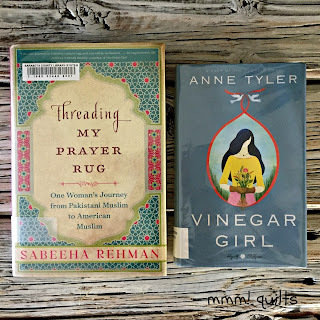 Vinegar Girl was a book Helen of Midget Gem Quilts mentioned on Instagram, a modern day take on a play I used to teach my grade 12 English classes, "The Taming of the Shrew". It was good, a light read from this American author. Currently, I'm reading another historical fiction, New York.which is very good, just a dozen pages in. He is English, but has lived for 30-odd years in New York and Connecticut, according to his Amazon author page. I haven't read any of his books before, but from my first impression of this one, a recommendation from a former teaching colleague, I will be reading more. What is my point for telling you the nationalities of these authors? I think it's to show that our world is a global community, and that being open to various cultures and religious points of view can help to promote that sense of togetherness. 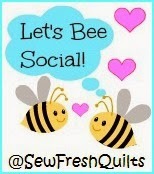 I think as quilter-bloggers, we have more of a sense of this than most. Travelling around the world and through time from the comfort of your armchair, beach chair, bed, or wherever you choose to appreciate art in word form, can enlighten a person and help create tolerance for all humans. First please accept my apologies if I don't respond in a timely manner to your comments on my last post...eeep! where I was published in Modern by the Yard. We are on the road for a few days here, heading back home so I have limited access to wifi. Last month we did Dragonfly. At the end of the post I said I'd give some variations on it for this month, variations that feel SO GOOD after hours in a car, ha, or at your machine. Sit as we did before, resting your sit bones on a quilt to elevate your hips and help tilt your pelvis forward. Check this post for more detail. Rmember you do not have to have your legs straight; you can bend your knees as much as you need to. A twist is one of the best favours you can do for your spine. Twists release tension. 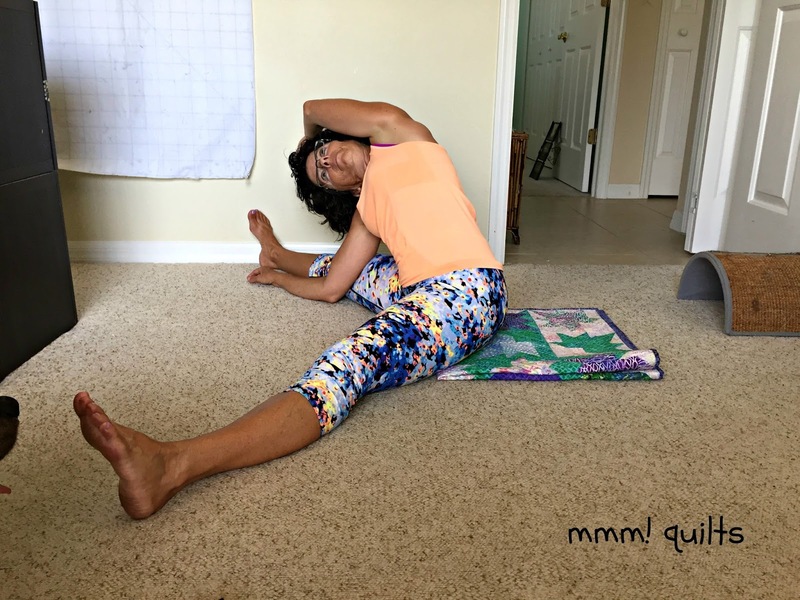 Orient your body over your right leg, inhaling as you twist. Place one hand on either side of your thigh, and turn your head, looking over your right shoulder. You can make this an eye exercise by looking as far as you can out of the corner of your eye. Then let your eyes fall softly shut and relax into the twist; don't pull; find the 'yin-side' (get it?!) of the twist. Remember we are concentrating on working our connective tissues, not the muscles, so feel and enjoy that tug. Where is it? How does it differ along the length of your spine? the sides of your waist? your hips? Breathe in. Breathe out. Hold here for 1.5 - 2 minutes. Inhale as you unwind coming back to centre. Exhale. Inhale as you twist now to the left. You can keep your hands on either side of your thigh or you might like to wrap your right arm behind your waist as you twist to the right, placing your left hand on the outer edge of your thigh. This is taking the twist a bit deeper; as long as you aren't using muscles to pull or push yourself further into a twist, then you might like this. Once again inhale, first of all lengthening along both sides of your spine. Then start to bend to the right, feeling how the connective tissues are getting a lovely stretch all along your left side. Think of bringing your ear to your shoulder, and notice how this brings a great stretch along the side of your neck. You can wrap your left arm behind your waist. Your right arm rests just inside your right leg, either on the floor or on a block. Alternatively, you may like to rest your left arm on the side of your head, as shown below. This gets nicely into the triceps and underarm, and is very good for the lymph nodes. Remember your breath, counting to 3 or 4, even inhales and exhales. 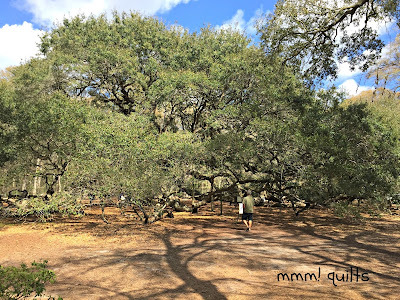 Relax as you exhale, not forcing your arms lower, just letting gravity have you. Come up on an inhale. Exhale. Take another inhale and exhale in the centre if you need to, noting the sensations. Then repeat on the left side. A final incredible stretch for the shoulders and arms, and probably a favourite of mine, is chest expander. You can do it standing upright, lifting your arms away from your spine, but I like to add the forward bend with my legs apart. I had a coach during these photos! Travelling...here's a shot I put on Instagram. 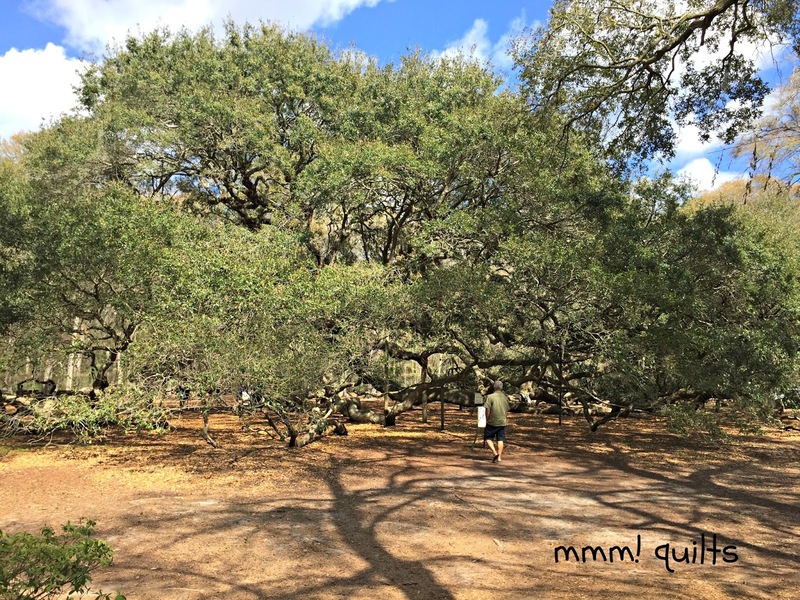 You know I have a thing, a profound thing, for trees, and I love quilts in trees. Well, as MacGyver said, "We drove an extra 80 miles for a freaking tree..." with a wink at me, and yep we did. Not just any tree. This tree. 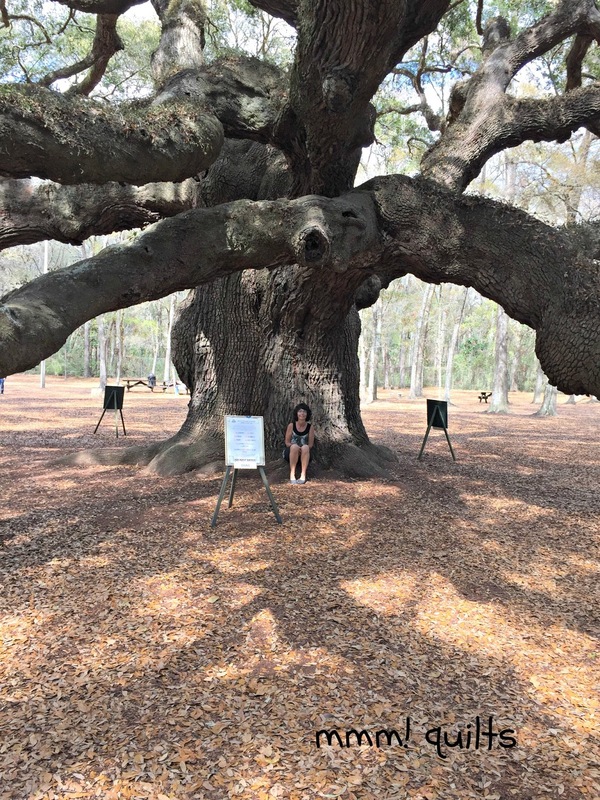 This is the Angel Oak Tree on Johns Island just outside of Charleston, South Carolina. It is truly wonderful, awesome, breath-taking. The things this tree has witnessed, sheltered, housed, the air it has cleaned over the centuries, give pause for reflection. That it has withstood 400-500 years of weather, humans, pests, human pests, ha, war...it boggles the mind. It was quite the zen moment to be able to see it and take in some of its majesty, wisdom and just 'being'. 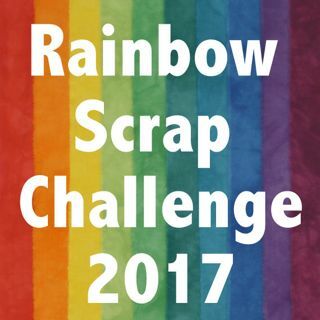 A note about the DrEAMi! linky: it is the last Saturday of the month, which was yesterday, but since A) I am travelling and B) there are another 6 days left in the month, I will have the linky next Saturday, April 1. If you are new here and wondering what the heck is a DrEAMi! then click here. 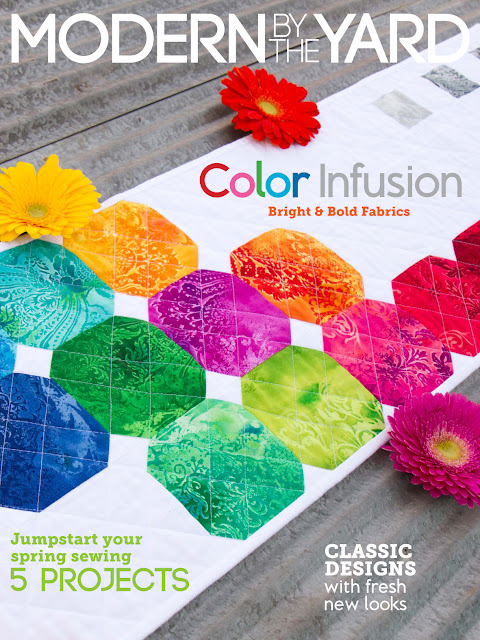 One of my goals for this year was to submit a quilt design to a magazine. Well I did. 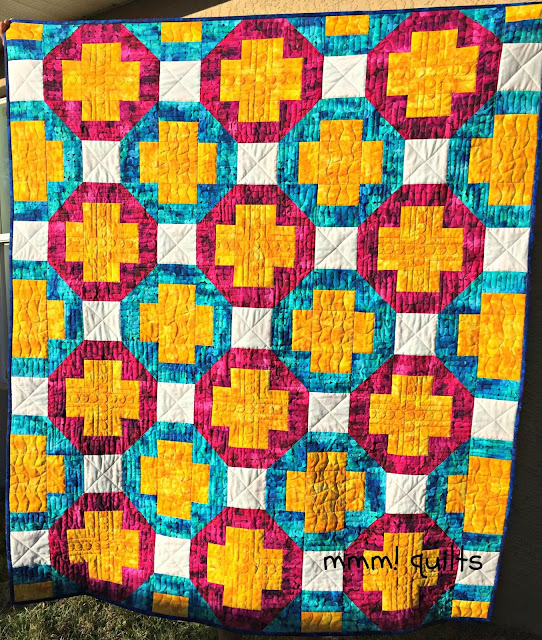 In fact, it was the first design I created for the #30quiltdesignschallenge2017 that I, along with Lisa of Sunlight in Winter Quilts, hosted on Instagram from Jan. 2 - March 15. I submitted it to Modern By the Yard, Benartex's e-zine. It was accepted! Not only was it a 2017 goal; it also became a Q1 FAL goal. I am so very happy that my first published pattern is in a 100% environmentally friendly e-zine! Not one tree was killed, YESSS! AND the magazine is free. 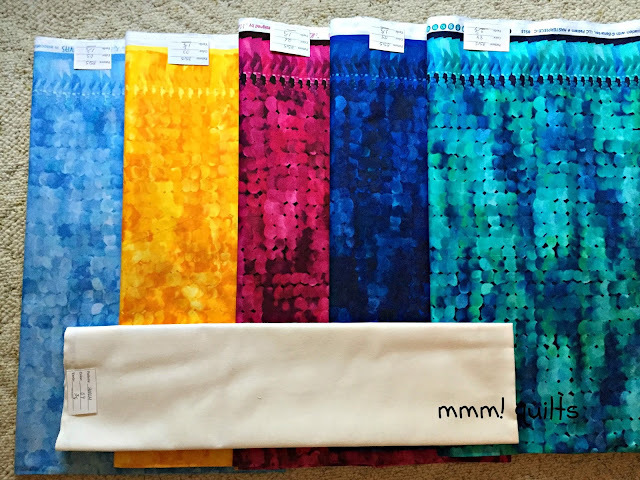 Just head over to Sew In Love With Fabric where you can click the link in the sidebar and view it on your computer, or download it and view it at your own pace. So! 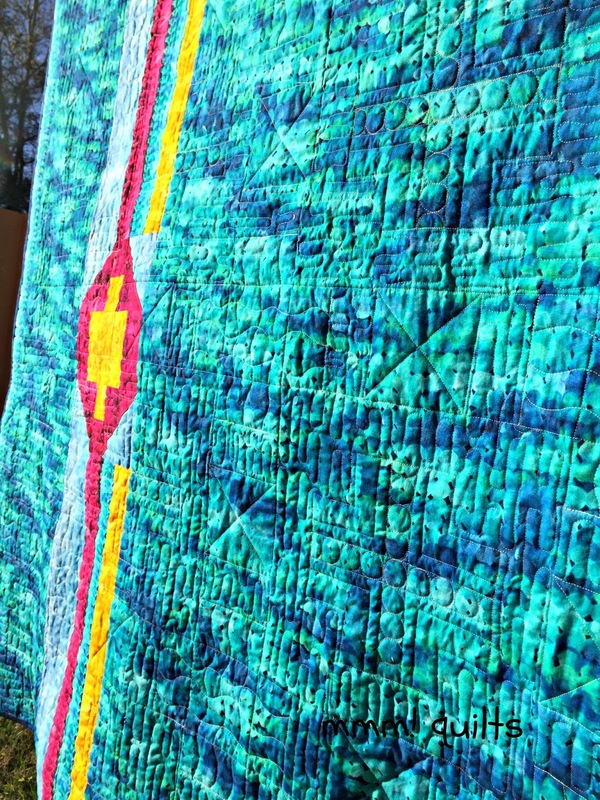 This quilt comes with a story. Do any of my quilts ever not? 😉 Refill your coffee or tea, and read on. 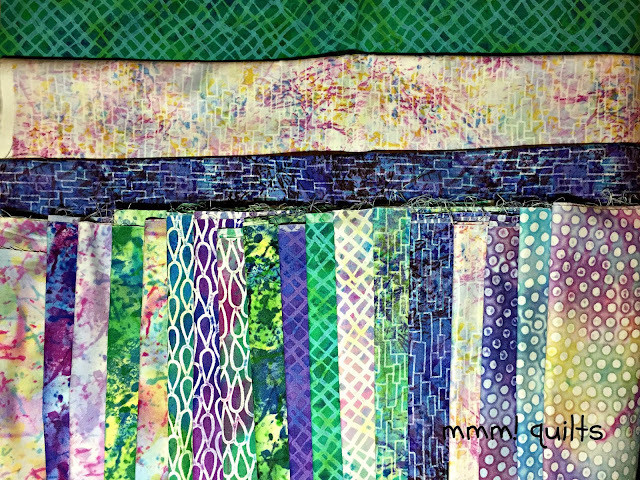 This fabric is deserving of a little of your time...it is every bit as vibrant, if not more, than what you see above! And such a unique pattern. 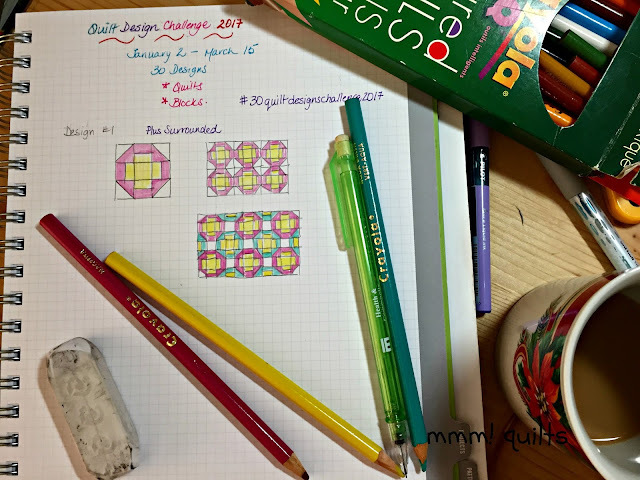 It started with this January 2 design, my first, as I mentioned, in the design challenge, that I called "Plus Surrounded". 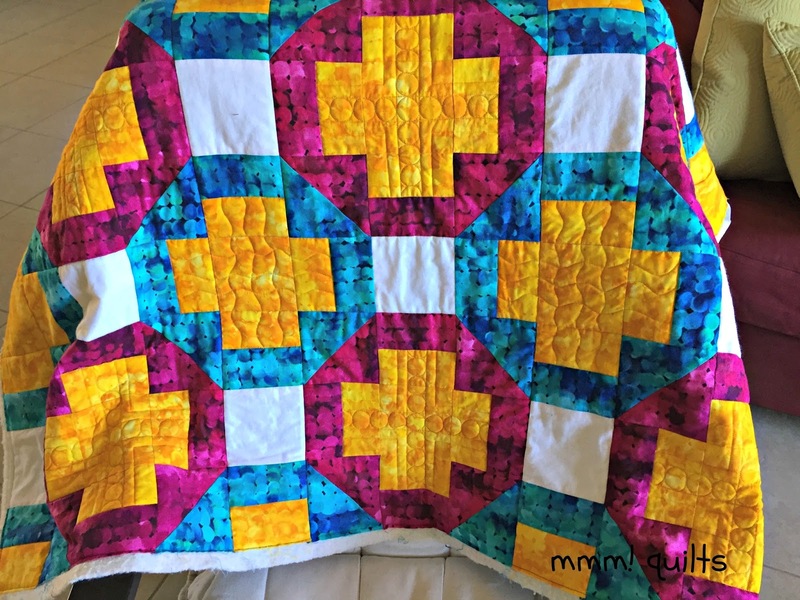 Lisa Ruble, the editor of the e-zine, really liked it and asked it I could make it a rectangular quilt, and send it to her by the second week of February. A little over a month to make a quilt? No problem. 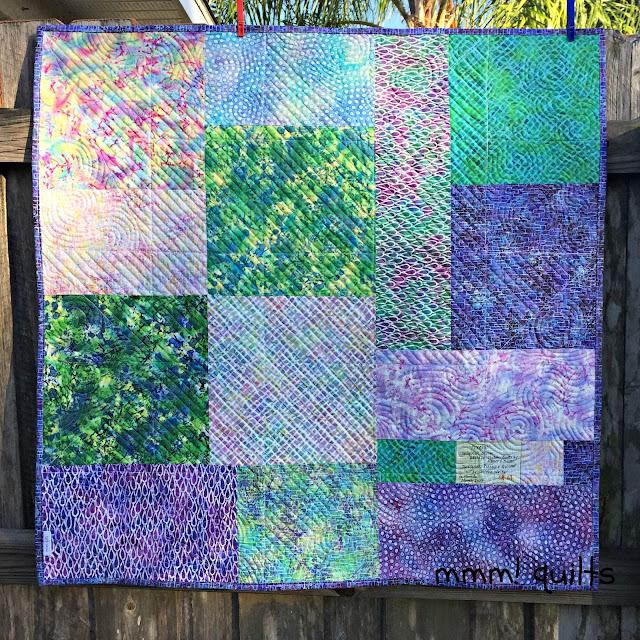 Meanwhile, Lisa and I had already talked about a totally different project, my Freefall Quilt Along, which I was planning to start about the third week of January and have it end on the Spring Equinox. I decided it might be prudent to move the QAL. Thus was born the idea of starting the QAL on March 20. You can see the first post with the fabric requirements for that entirely separate quilt project here. Back to Coins of the Atocha! 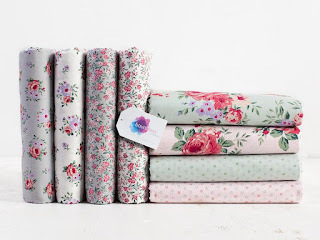 Lisa recommended two different fabric lines, and I chose this one, Masterpiece Mixers by Kanvas Studio. Don't you want to, oh, I don't know, bite into one or all of these?! The drama started when a couple of weeks went by and my fabric had not arrived. I contacted Lisa and she did some investigating...the warehouse somehow misplaced the order and it hadn't been filled. Lisa was wonderful and said no problem, we can put it in the next issue. But I was pumped! Well, I said to Lisa, I work well under pressure, so yes, I believe I can still meet the deadline. That photo above is of the fabric just after it arrived on February 1. I had already written up instructions to make my design so I set to work. More drama ensued when I felt that the blue I had chosen for one of the 'surrounds' around the plus wasn't quite right. I was drawn more to the aquamarine I had chosen for the backing. ...all the while thinking, hmm, backing...plan B...think! Yes!! Borders in the centre, borders on both long edges--love! Test block with lighter blue incorporated as well, woo hoo! It was at this point that my good friend Julie, at Pink Doxies, coined (lolol) the name of the quilt. I must admit I had never heard of the Coins of the Atocha, so I had to look it up. Fascinating stuff! Go here to read about it! Basically: 1622. Spanish galleon loaded with treasure. Hurricane in the Florida Keys. Struck a reef. Sunk. Undiscovered until July 1985. Well, I am in Florida for the winter, check. These vibrant tropical colours abound. Add the bubbles or round motifs in the fabric, the 1" diameter pebbles in the pluses, and yep! That is the name of this quilt. 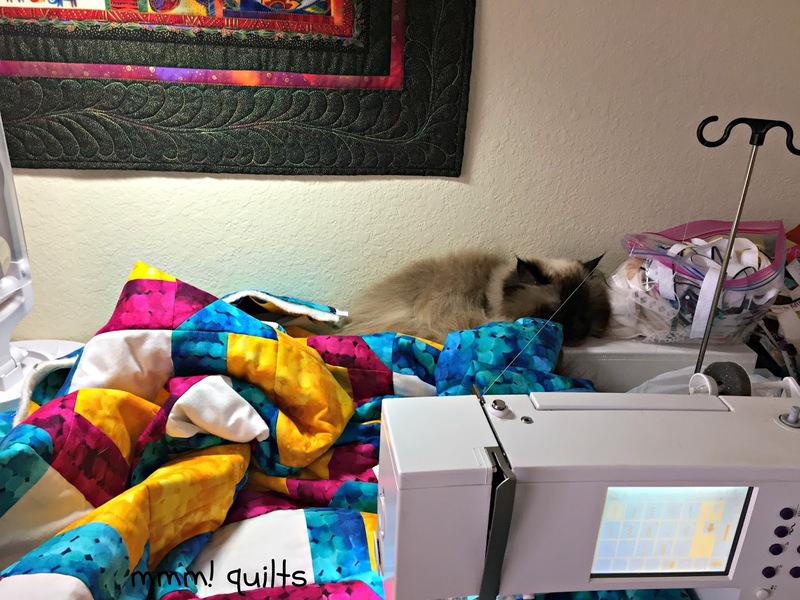 Bella loved the quilt--when does she not love a new or in-progress quilt?! Ain't movin' Sandra, nope. You can drape, push that quilt on me and I'm staying put. Right here. 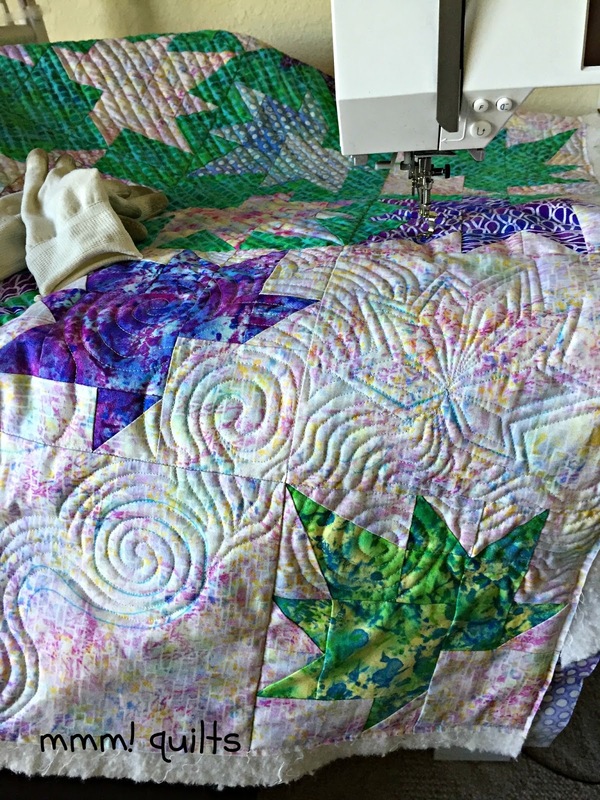 And relatively soon, it was done quilting. Grabbed it off the Bernina, trimmed edges, and threw it on the cement driveway in the setting sun's rays to catch the quilting. I did a water ripples back and forth in the 'surround' part of the pluses. Then I did X's through the white squares as I outlined the four 45-degree angles of the block edges. 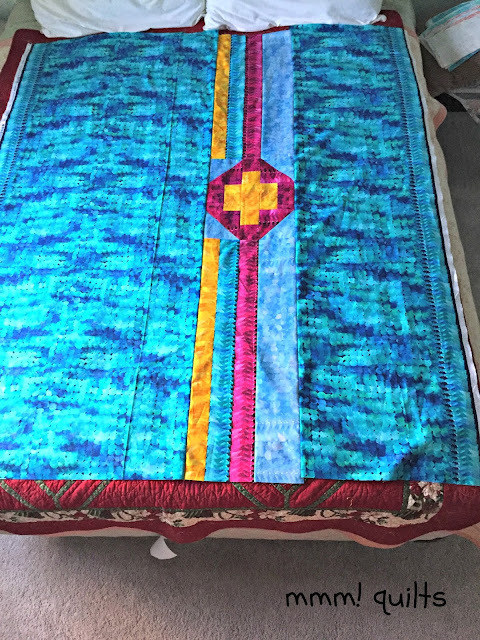 It gives the quilt an almost on-point look. Here are all the threads I used. 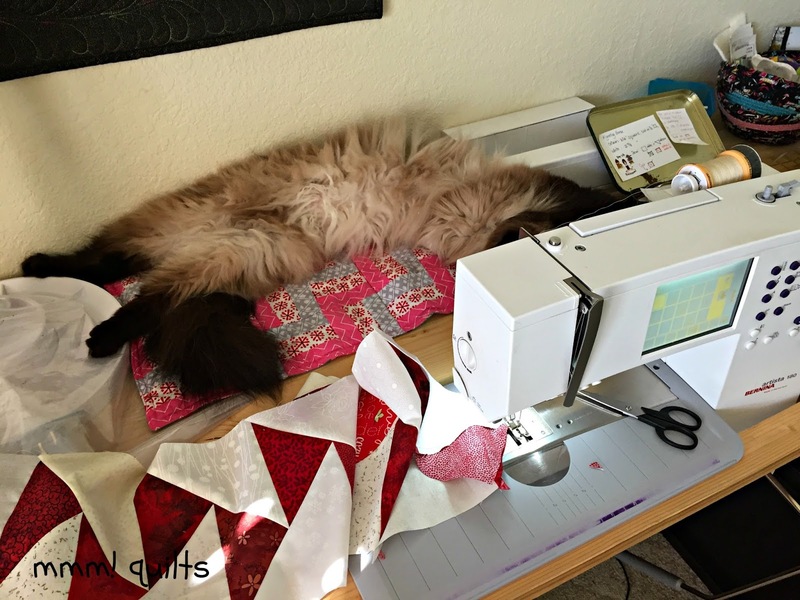 I love 'em all, as does my beloved Bernina. I pieced it with the Gütermann 100% cotton, and quilted with Sulky rayons, Aurifil 100% cotton, Mettler 100% cotton. 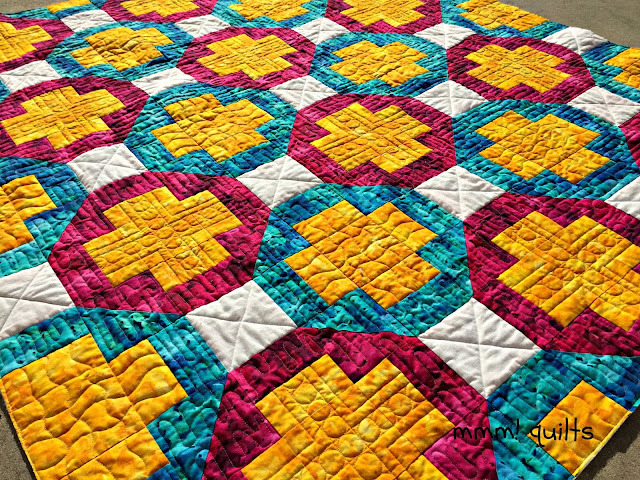 Here is the finished quilt, which is named "On the Plus Side" in the magazine. I love that it ahs three names, all great ones don't you think? 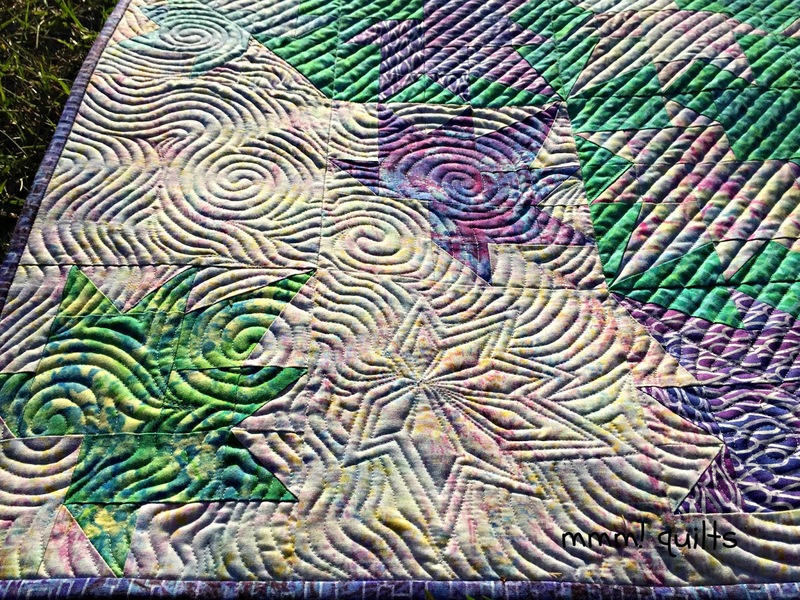 A shot of the quilting. Not quite in a tree but against one, a palm tree, of course! That was February 12, the day I mailed it. 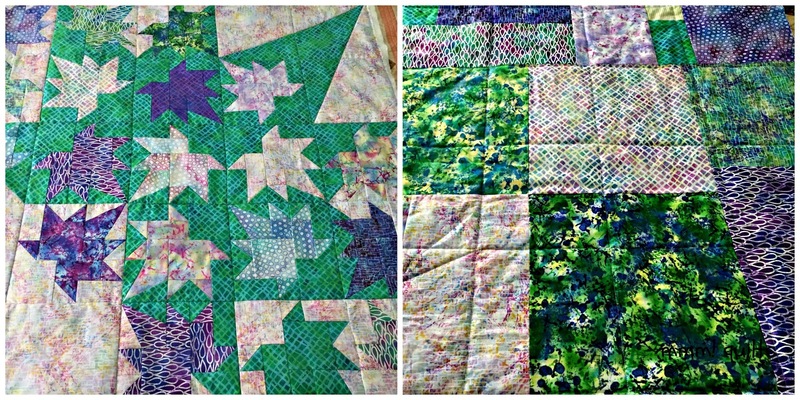 I think that may be a record for me for making a quilt from start to finish! The drama did not stop there. I mailed the quilt up to Lisa in Michigan. Tracking showed it to be delivered on the Wednesday. No quilt showed up, and Lisa even met her post-lady at the mailbox. Naturally, I freaked when she emailed me...About an hour later she emailed me back: her post-lady had returned; the package had fallen behind her seat so she hadn't seen it until later in her route! HUGE sigh of relief, from Florida to Michigan. This quilt definitely has that Spanish 'flair' for drama, si?! To add to the under-the-gun drama of this quilt, I only found out that I had to write a post about it this morning. On today of all days...we will be on the road somewhere in northern Florida by the time this post goes live. Today was the day before departure when there is not a minute to spare. However, we, meaning I, have been very organized this year, and so I am finishing this up right before heading to bed. Hmm, a really organized quilter should have had it written up a month ago ready for when the magazine would be published....ah well, all good. I will add the usual Quilt Stats once I have ... ha...A. access to wifi and B. some time! Meanwhile I am going to be floating above the SUV as we drive, knowing that I have been published! Just click the cover below to view or download your copy! 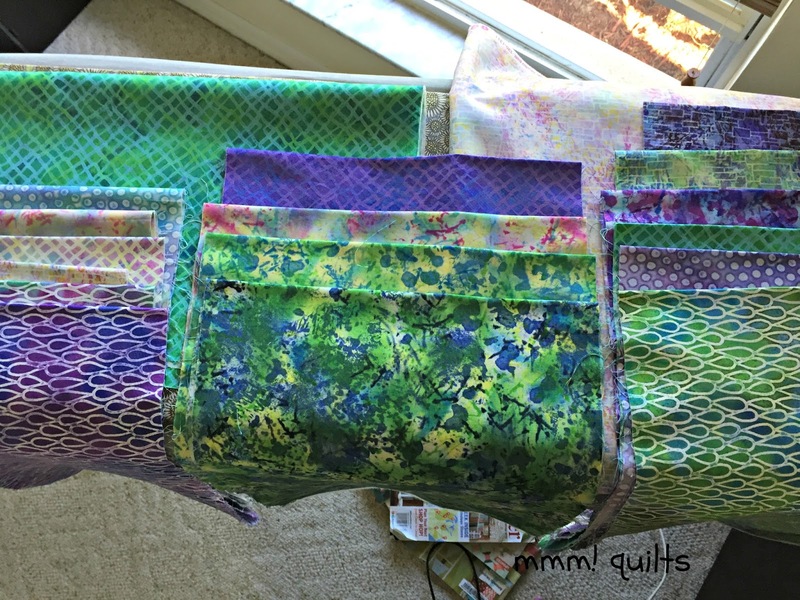 Hop on over to Sew In Love With Fabric and check out the other gorgeous projects! 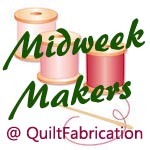 First, Angela Walter's show, Midnight Quilter, is coming back in a few days! Check out her announcement here. Second, while you're there, you may want to hop over to the Craftsy site (affiliate link) for a sweet sale on supplies this weekend! Have fun shopping -- I will, sniff, miss this one. 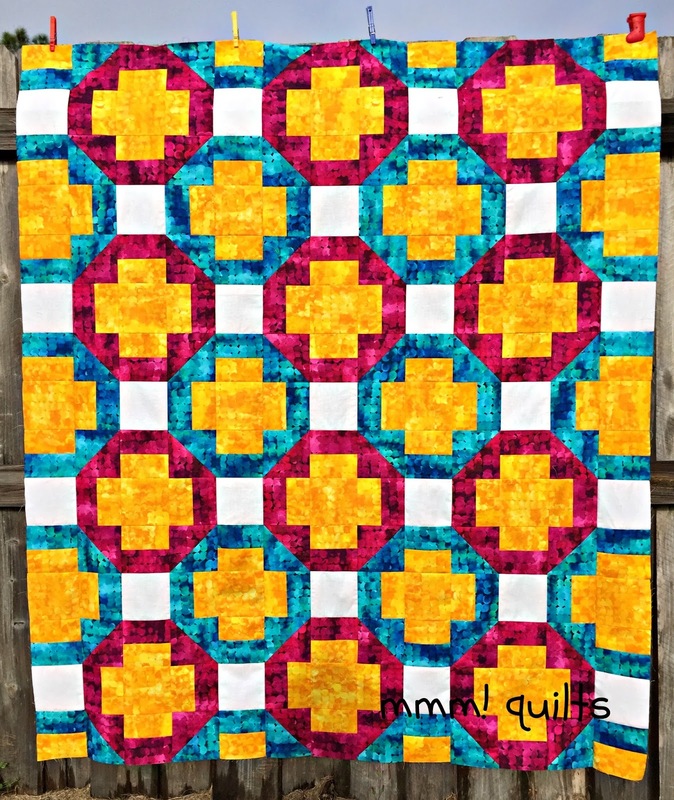 Welcome to the first installment of our Freefall wallhanging QAL! I am so pleased that you are here. Happy Spring Equinox, First Day of Spring, if you are in the Northern Hemisphere, Happy Autumnal Equinox, First Day of Autumn, to those n the Southern Hemisphere. 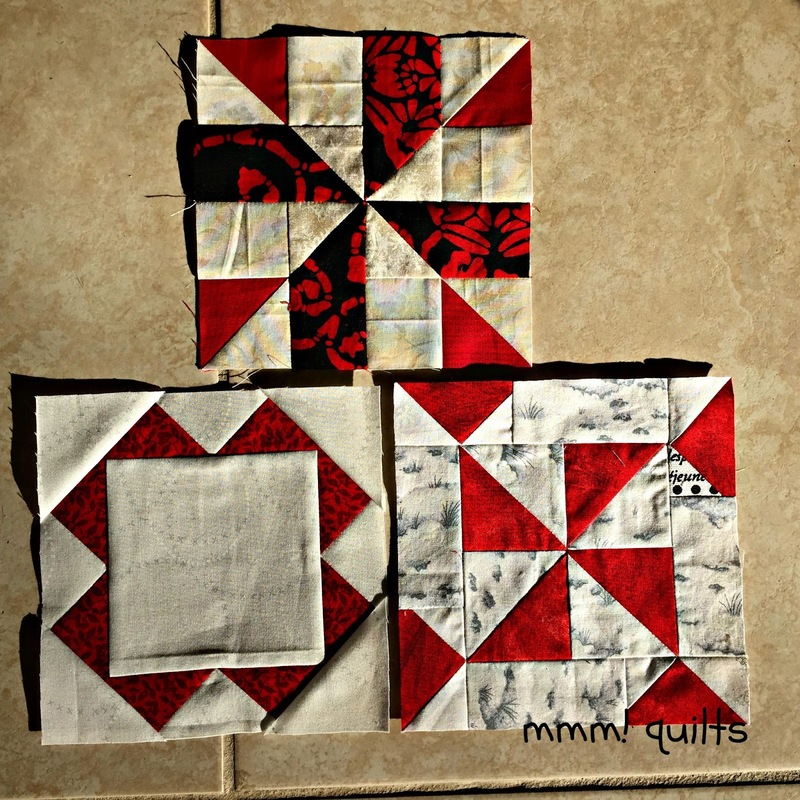 Who knew quilting would have me using so much geography and math! I am even more pleased to announce that I have got yet another prize for finished flimsies or quilts! 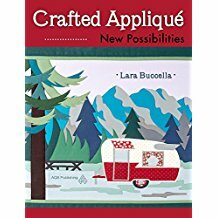 Lara of Buzzin' Bumble has offered a copy of her book Crafted Appliqué (that takes you to her book on Amazon; I'm not an affiliate, just a great book and technique to check out) to one lucky winner! I got to know Lara through Pets on Quilts at LilyPad Quilting; we love all animals, but dogs especially. We love good literature, from Harry Potter by J.K. Rowling to the poetry of Mary Oliver. She lives at the northeastern end of 'our' lake, Lake Erie, I live at the southwestern. I was so happy to be a part of her book launch last May. This brings the total value of prizes to a little over $250!! Wow! 1. Cut an 8.5" X WOF strip. Cut this further into two 8" squares. 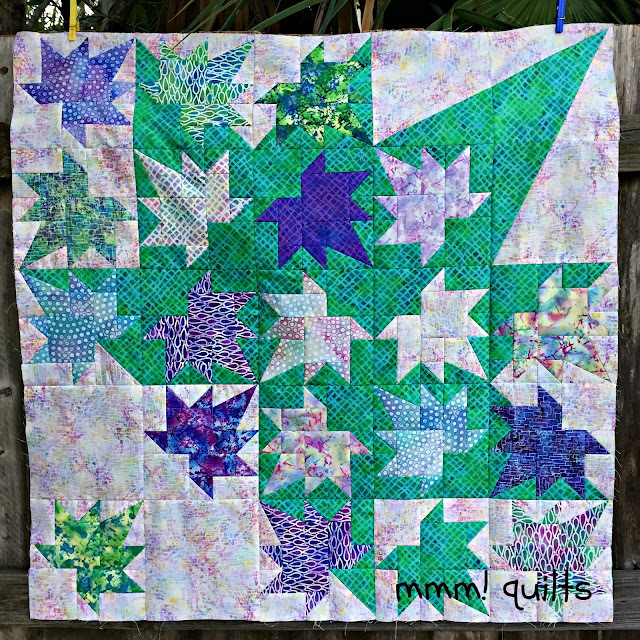 Look at the bottom lefthand corner of the quilt photo where there are four squares; two leaf blocks and two blank blocks. These are those two blank squares. Note! 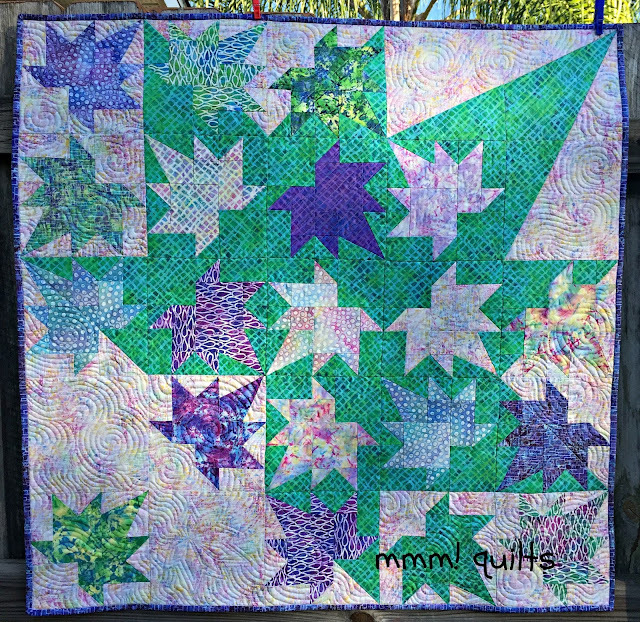 Set these two squares and the remainder of this strip aside for now; you will use it in Step 3 when we construct the big shadow leaf point in the top right corner of the quilt. (1) 2 3/4" strip by WOF; subcut into 9 rectangles 2 3/4 x 3 3/4"
You may want to label each of these sets, as it will be over the next several weeks that we pull from them. 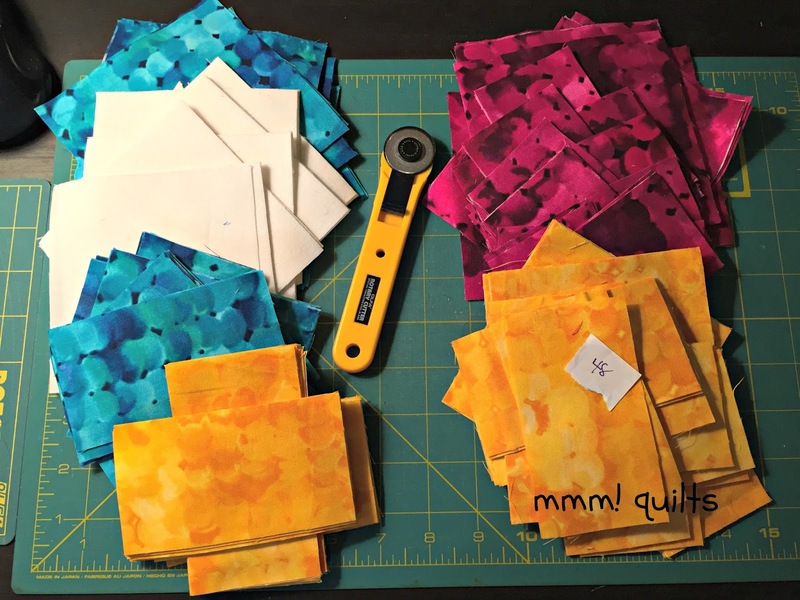 (1) 3.5" strip by WOF; subcut into 18 rectangles 2 X 3.5"
(1) 2 3/4" strip by WOF; subcut into 11 rectangles 2 3/4 x 3 3/4"
I still moved a few around after I took the photo! You may want to organize your sets of leaves into ziploc baggies.